The cardiac imaging community is facing a peculiar paradox. There is abundant evidence showing that CCTA is the most appropriate initial imaging test in patients with suspected CAD. The evidence has been presented at length here and elsewhere in this textbook. Yet CCTA is far less commonly utilized than older, less effective tests like MPI and SE (recall that in the Medicare population, MPI is used 53 times as often as CCTA). Possible reasons for this have been discussed earlier. Hopefully some of the obstacles preventing greater use of CCTA will be resolved as time goes on. The imaging equipment will undoubtedly become faster, more efficient, and more automated, thus allowing radiologic technologists to do most of the work without requiring the presence of a physician. Advances in software and machine learning are already occurring and will allow for computer-aided identification of exams that are normal. 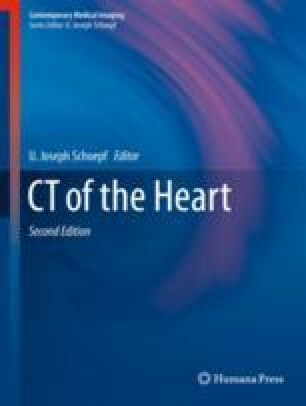 We must do a better job at educating our primary care colleagues and the nurse practitioners and physician assistants who work for them about the advantages accruing to early use of CCTA in their chest pain patients. Cardiologists and other cardiac imagers who have become overly accustomed to using MPI (perhaps because they own the equipment) should be encouraged to change their approach. As Arbab-Zadeh has pointed out (Arbab-Zadeh A, J Am Coll Cardiol Img 9:565–567, 2016), CCTA has come a long way and is ready for prime time. Cardiologists and radiologists must work together to make it happen.